I have always been impressed with the enormous output of scholarship directed to understanding biblical literature and backgrounds. In past years, I’ve posted paper titles or abstracts for presentations at the annual and international meetings of the Society of Biblical Literature: Baltimore 2013, Chicago 2012, London 2011, and Atlanta 2010. As Thanksgiving week has just begun in the U.S.A., and the annual Society of Biblical Literature conference is wrapping up in San Diego, it seemed appropriate to see what biblical scholars have harvested this year. The following comes from a keyword search on “Corinth” in the Program Book. Not all of the following papers concern Corinth topics, of course, but all of the following sessions have at least some discussion of Corinth or Paul’s Corinthian correspondence. There are presumably other Corinth papers that this keyword search did not reach, but this provides some cross-section of current discussions among New Testament scholars. To read abstracts, search by the paper title. Before the list, this word cloud produced in Wordle offers a great way to visualize the content of the paper titles and session abstracts. omotes an ‘apocalyptic theology’. However, there is little agreement on what this means. Scholars from different perspectives have, as a result, continued to talk past each other. 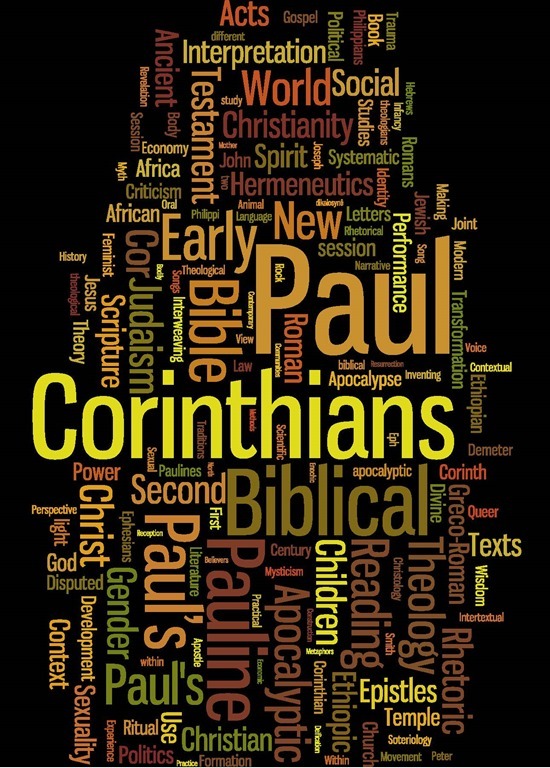 This special session provides an opportunity for leading Pauline scholars from different perspectives to engage in discussion about the meaning of Paul as an apocalyptic thinker. Indeed, one of the strengths and aims of this event is that different and opposing views are set next to each other. The session will hopefully bring greater clarity to the ‘apocalyptic’ reading of Paul by providing much needed definition to central terms and interpretive approaches and by highlighting both their strengths and weaknesses. This session showcases emerging New Testament scholars sponsored by Fellows of the Institute of Biblical Research. All are welcome to attend the session. Summaries of the papers will be read at the session leaving opportunity for discussion. Full papers will be available at the Institute of Biblical Research website: http://www.ibr-bbr.org/ (click on Emerging Scholarship on the New Testament Group) no later than October 1, 2014. For information on this session please contact Ruth Anne Reese (ruthanne.reese@asburyseminary.edu). Theme: Graphic Novels, Punk Rock, and Decolonizing the Bible? Oh My! This is the second of two sessions of papers representing new applications of the history-or-religions approach to the study of early Christianity in the broader Hellenistic and early Roman context. The Ethiopic tradition bears as many marks of originality as it does marks of external influence. Influences come from Christian traditions—like the Greek, Syriac, and Armenian—but also from Jews and Muslims in the Horn of Africa. Ethiopian theologians and community leaders developed their own sense of identity and expressed these in their form of the biblical text (unique in form and extent) and in various works of literature. This session invites a vibrant discussion on these themes.